Relax in our family-friendly, newly renovated apartment. The beautiful, large apartment extends over the entire upper floor. It is ideal for groups, family and friend meetings. Our garden is a place for nature lovers with beautiful flowers, children's playground and in the wake of meadows and fields in which you can unwind your soul, even on a starry night by the campfire. Our garden 5000 square meters, offers you a wonderfully clear view of Buchberg. Several seating areas are available for your afternoon coffee or a beer in the evening. Our garden is a play paradise for your children even in winter. In the nearby meadows, fields and forests you will find relaxation and tranquility in nature. Numerous sports activities such as cycling, mountain biking, climbing, extreme cycling, hiking, swimming, sailing, surfing, summer toboggan run, tobogganing, downhill skiing, cross-country skis, offer you, dear guests an unforgettable leisure time. The six-cycle cycle path network takes you past lakes and small ponds. If you feel like riding an e-bike, there is no problem in the neighboring village, there is a rental station, certainly an e-bike is there for you, which fits well with you. Mountain bikers get their money's worth on the Kornberg, there is a new track for extreme athletes. Radquartier offers other attractions to the extreme athletes in Kirchenlamitz. Experience the legendary rock labyrinth with its magnificent rock stage Luisenburg, with wonderful children and funny or classical plays. Explore the Katharinenberg in Wunsiedel with its bird of prey park, demonstrations and petting zoo. Enjoy the newly opened spa world and sauna area, it can be reached in just 5 minutes by car. Family-run restaurants in the region, invite dear guests and provide with Upper Franconian dishes and delicacies for an unforgettable taste experience. Restaurants are accessible from accommodation in 15 minutes on the bike and hiking trails. Warm invitation to you dear guests! Super beautiful spa with sauna world, has reopened in Weißenstadt, easily reached in 5 minutes by car. Ski lifts, cross-country ski trails are available in the immediate vicinity. 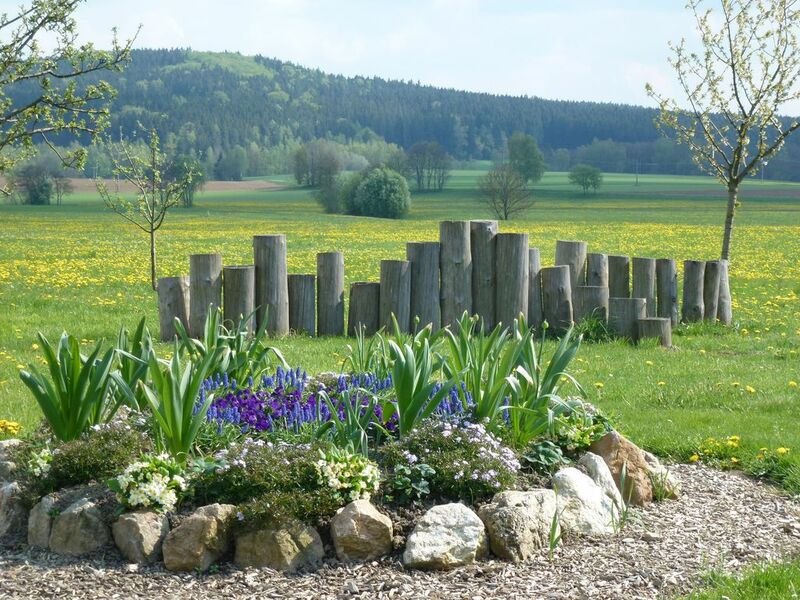 Our Fichtelgebirge is simply amazing and beautiful with its granite rocks the rock labyrinth and the natural stage Luisenburg. The Weißenstädtersee, Untreusee, Fichtelsee, various swimming pools and forest baths invite you to take a bath. Eventful for young and old: Forest climbing park with labyrinth, summer toboggan run at Ochsenkopf and Indorspielplatz in Hof An unforgettable experience, our game park in Mehlmeise. They hear the birds singing and the wild boars are smacking. Let yourself be surprised. Wir waren mit der Unterkunft und der Betreuung sehr zufrieden. Genug Zimmer und Platz für 4 Erwachsene und 5 Kinder. Die Wohnung ist sehr hell und freundlich, bequem eingerichtet. Extra Unterstellmöglichkeit für Kinderwagen und Schlitten. Wir haben uns sehr wohl gefühlt. Gerne wieder. Kleinigkeiten konnten wir sofort bei der Vermieterin/Vermieter nachfragen, was vieles sehr erleichtert hat udn wenig Zeit in Anspruch nahm. Vielleicht sollten wir auch mal im Sommer vorbeikommen, damit wir den Garten mit seinen schönen Fleckchen ausprobieren können. Vielen lieben Dank für Ihre schöne Bewertung. Wir würden uns riesig über eine neue Buchung in der Sommerzeit freuen.Sie waren wirklich eine sehr nette Familiengruppe und vielleicht möchte auch Oma und Opa mitkommen, das wäre schön. Ist eine super Unterkunft. Ist viel Platz für eine Großfamilie. Die Fewo war weihnachtliche geschmückt und man wurde von der Familie Reihl herzlich empfangen. Hallo liebe Familie Kadow, schön das es Ihnen bei uns gefallen hat..
Ganz besonders liebe Grüße noch an Ihr Töchterchen. Wir würden uns sehr freuen Sie als unsere Gäste ein zweites mal bei uns begrüßen zu können, vielleicht dann auch zu einer anderen Jahreszeit. Vielen lieben Dank für die wunderbare Zeit in Ihrer schönen Ferienwohnung und Ihre Gastfreundschaft liebe Familie Reihl. Wir haben uns rundum wohl gefühlt. Wunderschöne und liebevoll eingerichtete Wohnung mit viel Platz für Erwachsene und Kinder! Familie Reihl hat sich Liebevoll auf unsere Bedürfnisse eingelassen und sogar einen kleinen kindertisch hergerichtet! Der Garten ist ein Traum und bietet für Groß und Klein Beschäftigung und Entspannung, Spiel und Spaß! Absolut zu Empfehlen! Ruhig und erholsam, nah am Skigebiet Ochsenkopf, Wohnung sauber und gepflegt, gute Wanderwege z.B. Ruine Epprechtstein, Familie Reihl ist sehr gastfreundlich und nett, nichts für Luxus verwöhnte, Therme in der Nähe. liegt auf ca.600m Höhe und damit ziemlich schneesicher, wie gesagt schöner Kurzurlaub. Find your rest and tranquility in nature while biking, hiking and walking or tobogganing and cross-country skiing with the skis. Dive into our new spa world, with spa, in Weissenstadt, just 5 minutes away by car. Experience our beautiful Fichtelgebirge with its various, magical facets. The rock labyrinth with its wonderful nature stage. The quarry trail around the Raubritterburg Epprechtstein. The game park in Mehlmeisel. The bird of prey park in Wunsiedel. The biggest porcelain market in July in Selb. The climbing wall in the sugarloaf.